The following article was originally published in the July/August issue of AOG magazine. The article appears on IPAGlobal.com with permission from AOG Digital. When oil prices exceeded US$110/bbl more than two years ago, oil and gas companies were getting away with overstaffed and overspecialized project teams and bloated asset development portfolios. Companies had an easier time turning a deaf ear to calls for improving exploration and production (E&P) capital efficiency and productivity. Research led by Independent Project Analysis (IPA) at the time warned of an unsustainable upward trajectory in the cost of doing projects globally, including in the Asia Pacific region. The market for E&P development services and equipment was strained, and the availability of experienced talent was limited. An E&P project bubble propped up by high commodity prices was the only reason many developments stayed in a company’s project portfolio. It was only a matter of time before the bubble burst in mid-2014 and national oil companies (NOCs), supermajors, and independents alike began slashing their capital expenditures and canceling or delaying projects. While super majors and independents laid off rig workers and staff, NOCs, less able to reduce their workforce, had to get creative at reprioritizing capital investments. Over the last few months, many owner companies have been successful at reducing costs by negotiating supplier and service reductions. Such cost reductions are helpful, but project costs remain high and competition for talent continues today in spite of oil industry layoffs. The need for cost efficiency in capital projects has not gone away. If anything, today it is more crucial for NOCs and independents operating in the Asia Pacific region to increase the capital effectiveness of their projects. Whether companies have concentrated on reining in costs via staff reductions, restricting training and travel expenses, or reopening supply chain negotiations, such cost containment measures provide only temporary relief—and some may even cause long-term harm. These measures are the low hanging fruit of cost savings. Asia’s NOCs and independents investing in the Asia Pacific region need to move beyond the short-term cost reduction tactics used to fill treasuries and preserve cash flow. What follows below are two specific issues that NOCs and independents should address immediately to ensure they become more capital efficient organizations. The issues center on project organization staffing levels and competitive project scoping. Regardless of whether oil prices remain at current levels or increase, owner companies can realize significant cost efficiencies by rightsizing project teams. E&P organizations have historically struggled to measure how project organization staffing levels affect project system performance. 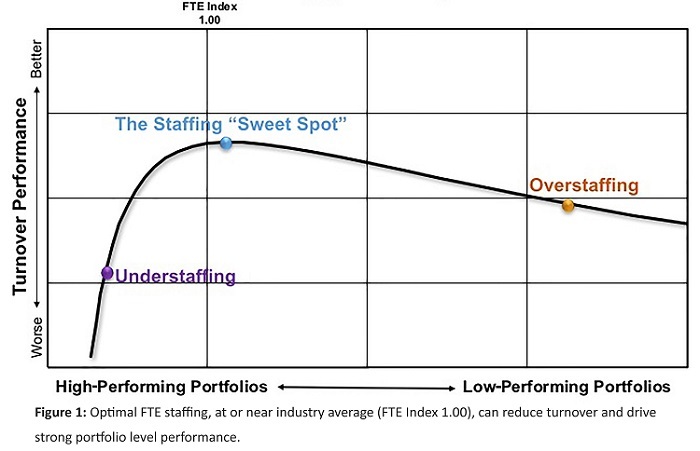 However, recently completed IPA work shows it is possible and advantageous for companies to find the right size of portfolio staffing that represents a ‘sweet spot’ for achieving efficiencies in system performance (Figure 1). Based on the analysis of hundreds of E&P projects, IPA has created a full time equivalent (FTE) index that measures staffing levels and correlates them to portfolio level outcomes. These portfolio performance outcomes include cost growth, schedule slip, project manager turnover, and late changes. As IPA’s research confirms (Figure 2), staffing a project portfolio correctly is critical to project success. Understaffing, both in total and in relation to various functions, strongly correlates with increased turnover and a greater likelihood of disappointing project results. On the other hand, overstaffing projects is also shown to reduce project performance. Of course it comes as no surprise that project staff sizes have shrunk due to tightened capital project spending. But the extent to which independents in particular have reduced the number of FTEs assigned to projects should raise eyebrows. As the demand for qualified project workers increased over the last decade, qualified people for project staff positions were in short supply. This demand for talent contributed to major cost inflation. But the decision to let go of project professionals through layoffs and hiring freezes may prove costly in the not-so-distant future, especially if project activity increases. To make matters worse, companies made the same mistake in the late 1980s when hundreds of staff workers were laid off. Why are we doing more of the same? 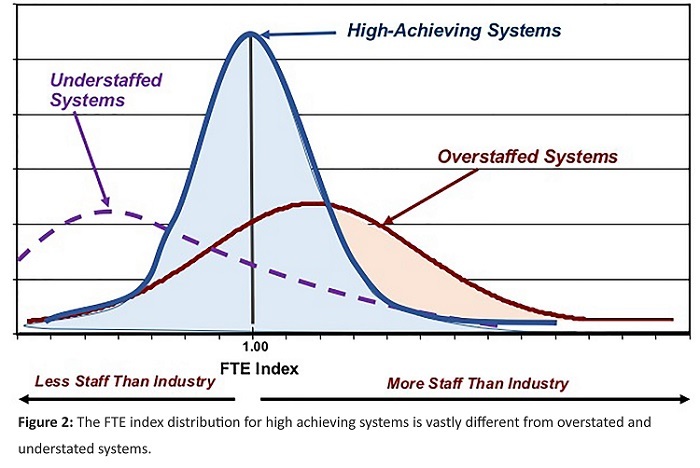 Staffing reductions are a key lever in helping conserve cash and profits, but are the tradeoffs appropriately considered and quantified? Our work with many oil and gas companies suggests they are not. One only needs to consider the cost efficiencies companies could be realizing today had they maintained the right sized project staff before oil prices fell two years ago. Independents may have their work cut out for them, although long-term cost benefits can be gained. As for NOCs, rightsizing staff assigned to projects today can help projects stay competitive with independents as independents spend time staffing up once again. The second lever, a highly valuable and often underused lever, companies have of ensuring long-term capital efficiency is that of competitive scoping. In the heydays, most operators, driven by NPV, chased every marginal barrel even if that barrel was incrementally less capital efficient. Now we face the struggle of unlearning those tendencies and designing a minimal scope. But the biggest efficiencies can be found earlier by designing ‘lean’ or ‘competitive scoping’. The goal is to streamline scope to only what is necessary to satisfy business objectives. With the right structure and commitment, this is easy to set up and, as our experience with some clients shows, the savings can be immediate and substantial. Figure 3 illustrates two competing capital investment strategies. 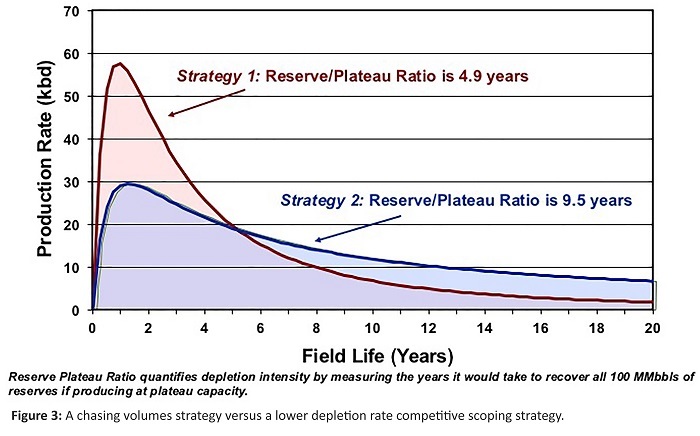 Strategy 1, the red curve, delivers a high production peak and a rapid decline. Strategy 2, in blue, delivers half the production rate in the early years with a more modest decline. The oil and gas industry has grown accustomed to pursuing opportunities like Strategy 1—the chasing volumes strategy. However, Strategy 2 represents the more sustainable, competitive, lean scope that industry ought to purse in today’s lower oil price market. Lean scoping is not just a facilities exercise, however. A change in the development mindset is required. It requires business executives and project managers to think about a minimum acceptable scope. Tools supporting facilities cost and schedule benchmarking are necessary for measuring development performance. But a cost per foot metric tells you nothing about the efficiency of your depletion plan or your overall development strategy. Companies operating in the Asia Pacific region and beyond need to recognize that supplier reductions and other short-term cost reduction measures will not make projects profitable in today’s environment. The long-term development efficiencies and capital savings resulting from right-sized portfolio staffing and competitive scoping will pay off in the event that oil prices fall again, and especially when they climb again. Oil prices having rebounded from lows of under $30/bbl earlier in 2016 and some industry prognosticators are opining that E&P investments across the Asia Pacific region may outpace other regions in the near future. It, therefore, behooves NOCs and other regional operators to seek out more meaningful and lasting means of fostering capital project spending efficiencies. Companies opting to dismiss right-sized project staffing and competitive scoping efforts risk repeating past mistakes. Tim Mumford, an advanced associate analysis at IPA Asia Pacific, recently led IPA’s E&P project staffing research. Mumford has been involved with and led dozens of offshore and onshore E&P project evaluations located globally since joining IPA in 2011. He holds a Master of Business Administration and a Bachelor in Electrical Engineering, both from RMIT University. Rolando Gächter is IPA’s regional director for client engagements in the Asia Pacific region, leading IPA offices in Singapore and Melbourne. During his 17 years at IPA, Gächter has held various IPA leadership roles and reviewed more than 100 major capital projects worldwide in the E&P, and mining sectors. He holds a Master of Business Administration, and a Bachelor of Science in Mining and Minerals Engineering, both from Virginia Polytechnic Institute and State University.